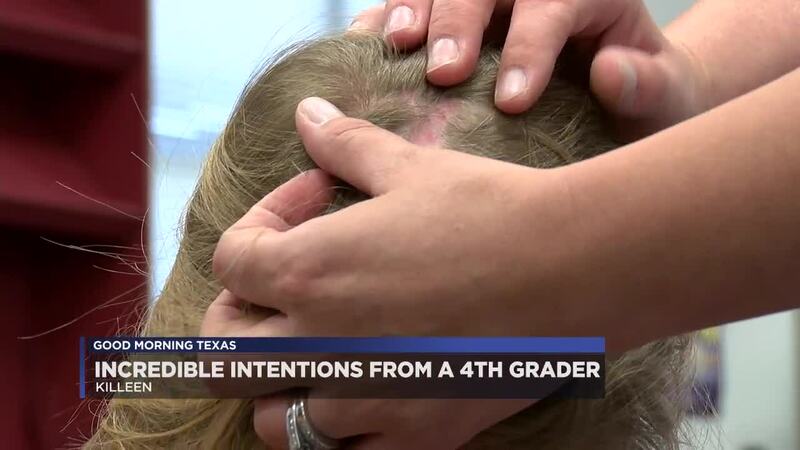 KILLEEN, TX — Briana Liles, fourth-grader at Trimmier Elementary school, was diagnosed with alopecia areata, an autoimmune skin disease that causes hair loss when she was in Kindergarten. Briana said when she started school, she was bullied for her alopecia at first, but she chose to keep her head held high. Instead of giving in to the bullying, she started educating people on what alopecia is, and even raised over $900 for others with alopecia. She collected the money by hosting her largest fundraiser ever, working a total of 24 hours in two days she sold lemonade, sweet tea and other goodies. Briana is being awarded the Incredible Kid award at the 20th annual Incredible Kid celebration hosted by Central Texas Youth Coalition on April 17. Last year she volunteered more than 800 hours to the community. If someone suggests she should cut back on the service hours she'll just say, "I don't care, I'm doing what I love." Briana will lose parts of her hair in chucks, growing it out as much as she can she almost went a whole year without any hair loss until recently. "She lost a chunk of hair at the top of her head, it was a lot bigger before but it's slowly growing back," said Briana's mom Christy Liles. "It's growing back slower than normal." Briana loves long hair and doesn't plan on cutting it anytime soon. Most of her family members are growing their hair to donate to other people with her same condition. Briana will always continue to educate others on her condition, it is harmless and a common disease among most people. According to the Mayor Clinic there are more than 200,000 cases in the U.S. each year. If someone bullies Briana because of her hair loss, she said she tries to let them know that she can't help her condition. "I try to explain to them and sometimes they still bully me because they don't really understand how it feels and then some just understand and stop," Briana said. Her mom couldn't be more proud of the work she does and the strength she has. Trying to keep up with her busy schedule, Christy Liles, loves seeing her daughter achieve great things. "It's amazing that girl keeps me on my toes," Christy Liles said. "It's just really important because while she's doing all those hours I'm usually the one behind the camera." All her community service hours have earned Briana the bronze, silver, and gold Presidential Volunteer Service Awards. On top of raising money for alopecia patients, she volunteers at local nursing homes, picks up trash on the side of the road and collects goods for the local animal shelters. "My favorite type of volunteer work is picking up trash because you get to see all the crazy things that people throw out of their car," Briana said. She also has a Chihuahua named Bella, she takes care of the pup all on her own and got it with her own money. What they didn't know when they picked Bella was she too has a form of alopecia called color mutated alopecia. It was a match made in heaven they say. Despite her condition, Briana keeps one thing in mind. "It's okay because it doesn't matter if you have one strand of hair or no hair or a bunch of hair it just matters because true beauty it comes from the heart and not from hair,"Briana said. Briana will be hosting another lemonade stand raising money for the Children's Alopecia Project this May. On May 4, she will be selling lemonade, sweet tea and other goodies at Heights Lumber & Supply from 8 a.m. to 1 p.m. and the Killeen Sprint Store by Hobby Lobby from 2 p.m. to 8 p.m.
On May 5, she'll be at the Copperas Cove Walmart with her lemonade stand from 9 a.m. to 9 p.m.